The Monthly Climate: May 2011 | Fresh Air. The Scent of Pine. Since record keeping began in 1895 the United States has never seen a month so dominated by extreme weather contrasts as May 2011. Based on data from NOAA, during the month of May 19.5% of the country was experiencing severe to extreme dry conditions while 35.2% was experiencing severe to extreme wet conditions. There have been months when the country has been drier and others when the country has been wetter, but there has never been a month in over 100 years with so much of the country at both extremes at the same time. Dry conditions continued to dominate the southern U.S. with states from Texas to Florida having months ranking in their top ten driest historically. While the percentage of the country experiencing moderate to extreme drought held close to steady from April at 26%, the area under the two most intense categories, extreme and exceptional drought, has increased for fifteen consecutive weeks through May. Texas has now had its driest spring (March-May), 6-month period (December-May), and 8-month period (October-May) in recorded history with over half of the state (51%) classified as experiencing exceptional drought by the end of the month. Under these dry conditions, wildfires continued to rage across the South. During May, 6,625 wildfires burned 1.1 million acres in the country, an historical high for the month over the 12-year record. Over the year-to-date, 3.45 million acres have burned, also a record. This is in stark contrast to many states in the West and Northeast that experienced May rankings in the top ten wettest in history. Nine states in the Ohio Valley region including Indiana, Kentucky, Ohio, New York, Pennsylvania, Vermont, and West Virginia had their wettest spring on record with storms providing nearly 300% of normal regional precipitation amounts. Combined with snowmelt, this intense precipitation led to record and near-record water levels and flooding on the Mississippi and Ohio Rivers. Along the Mississippi, the Birds Point New-Madrid Floodway, the Bonnet Carre’ Spillway, and the Morganza Spillway were all opened simultaneously for the first time in history to avoid flooding of towns and cities while relieving pressure on control infrastructures. The decision to breach part of the Birds Point New-Madrid Levee released water at a rate eight times that of Niagara Falls, intentionally flooding 130,000 acres of Missouri farmland. 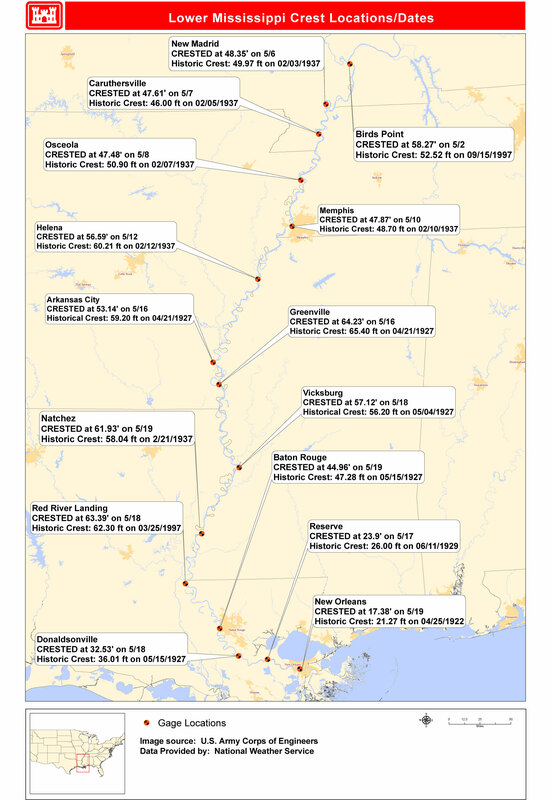 Despite these interventions, in Memphis, Tennessee the Mississippi River crested at 47.9 feet, just below its historical record of 48.7 feet from 1937. Overall hundreds of thousands of acres of farmland from the Great Lakes to the Gulf Coast were flooded in up to 20 feet of water for weeks. The Missouri River basin also experienced its fourth wettest spring and its third wettest May on record with Wyoming experiencing its greatest spring rainfall in history and eastern Montana receiving May precipitation amounts 300% of normal for the month. Runoff from record and near-record winter and spring snowpack in the Northern Rockies and High Plains contributed to filling all six of the river’s reservoirs forcing their release and leading to breached levees and mandatory evacuations downstream. The flooding is expected to continue through early summer. To the east, the wettest spring on record for Vermont and increased snowmelt from above average regional temperatures contributed to historical water levels at Lake Champlain, straddling New York, Vermont, and Canada. The lake water rose to a record 102.8 feet at Rouses Point, Vermont, well above the typical 97 feet, and remained near that record level for several weeks. The Richelieu River, the lake’s outlet to the north, experienced a 150-year flood. The storm systems bringing so much precipitation also generated a preliminary early count of 370 tornadoes during the month. While less than half of the 875 preliminary count from April, the final count will likely still be above the 1981-2010 average of 253 for May, which is typically the most active tornado month of the year. 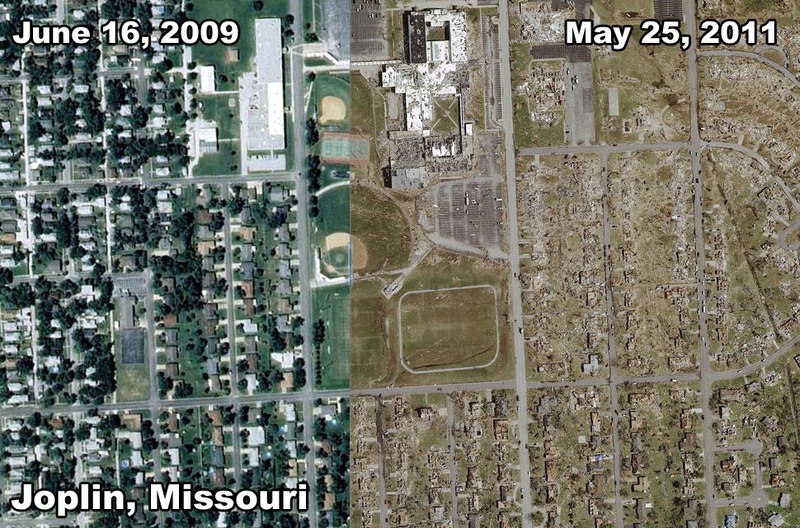 The most devastating tornado tore through Joplin, Missouri on May 22. The EF-5 storm, which packed winds in excess of 200 mph, remained on the ground for about 6 miles, and had a maximum width of 3/4 mile, is being blamed for more than 150 deaths and over 1,000 injuries. This makes it the deadliest U.S. tornado in the modern record since 1950. In the first five months of 2011, there have been 1,482 preliminary tornado reports, already closing in on the yearly record for tornadoes of 1,692 set in 2008 and well ahead of the record pace of 1,011 for the first five months of the year. 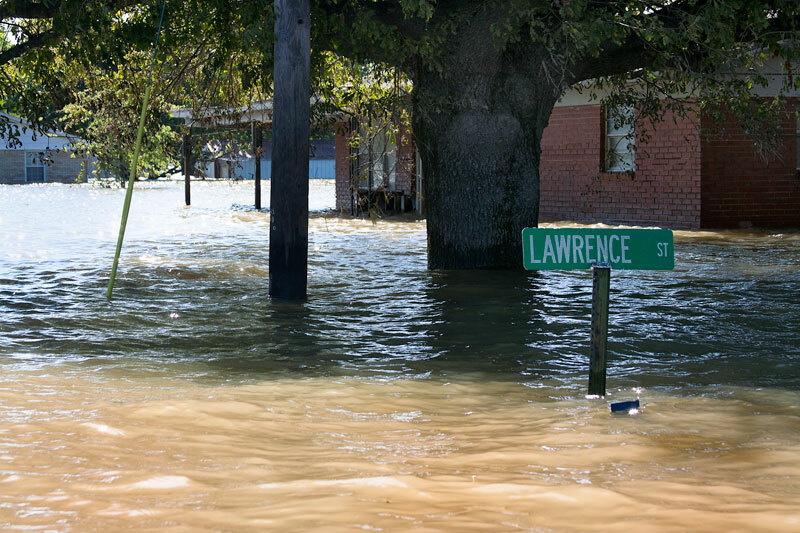 The spring of 2011 will be remembered as one of the worst flooding disasters in U.S. history. Financial impacts from the flooding alone were and will continue to be felt across multiple industries for years including agriculture, fishing, shipping, insurance, refineries, and tourism. NOAA estimates that 3.5 million acres of farmland within the Lower Mississippi River Valley were washed out, and 6.8 million acres were flooded overall. Total insured losses from flood damage currently amount to approximately $2-4 billion dollars. Massive amounts of fresh water reaching the Gulf of Mexico have also wiped out oyster beds, and fertilizer and other chemicals included in the fresh water are expected to create the largest dead zone ever recorded at the mouth of the Mississippi with disastrous impacts to Gulf fishermen who have struggled to recover from Hurricane Katrina and the BP oil spill in recent years. From ABC News, the disaster has also generated concern over cash-strapped federal programs like the National Flood Insurance Program (NFIP), with some arguing that taxes are subsidizing continued building in high risk areas. Designed to assist homeowners living in flood plains, the program paid out $709 million in assistance last year and looks to face a much higher bill this year. As reported by USA Today, the timing of the flood damage to cropland also impacts the ability of farmers to receive assistance. The Agriculture Department’s crop-insurance program only covers losses from damaged or destroyed crops which excludes much of the damage since many seeds had not been planted. The department’s program that helps restore damaged and flooded land which is usually funded through emergency legislation has only $30 million available. Drought conditions have contributed even further to the economic toll. The June 5 report from the USDA found more than 70% of the wheat crops in New Mexico and Oklahoma and over 50% in Kansas to be in poor to very poor condition. Over a quarter of the wheat in Colorado and Arkansas, the corn in Georgia and South Carolina, the soybeans in Louisiana, the cotton in Louisiana, Alabama, and Georgia, and the peanuts in Alabama and Georgia were in the same poor condition. But perhaps heaviest hit has been Texas where over 70% of the wheat and oats and over a third of the corn and cotton were found to be in the same state of near failure. As reported by NOAA, according to the Texas AgriLife Extension Service, it is estimated that from November 2010 through May 2011, Texas ranchers lost $1.2 billion because pastures have not greened across the state. The Texas wheat crop this year has been valued at $274 million dollars, which is less than half of the five-year average. In addition to the pasture land loss, livestock losses will also top $1 billion dollars due to lack of water and feed for cattle. Insurance companies and aid organizations were feeling the impact. State Farm, the nation’s largest home insurer, has received nearly 300,000 claims in April and May alone and has paid $916 million in storm claims this quarter. The company expects both numbers to rise. Meanwhile Red Cross spent $41 million responding to disasters in the 7-week period prior to May 25 while raising only $33.6 million to cover the costs. NOAA reported that, according to preliminary numbers from various disaster cost modeling and insurance risk reports, the estimated damage from the spring severe weather outbreaks will approach $12 billion dollars. 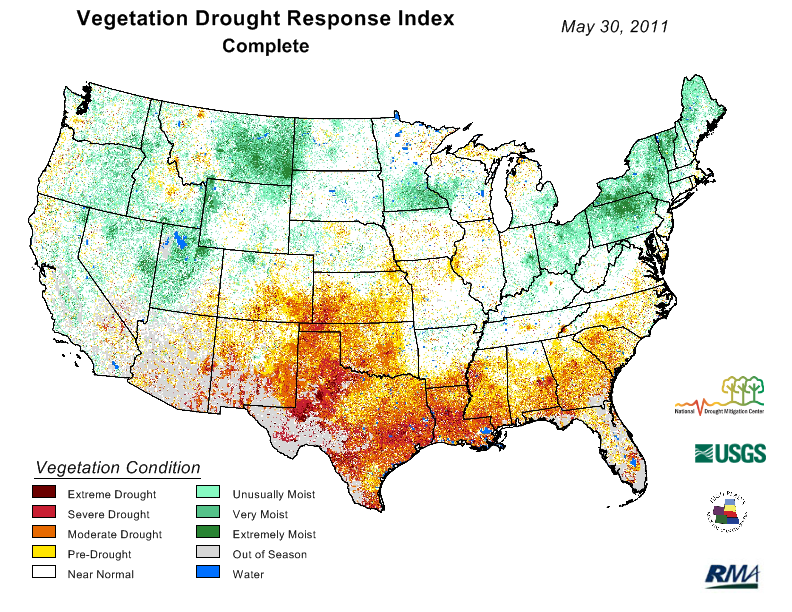 During May severe drought, flooding, and wildfires were experienced well beyond the borders of the United States. Driven by hot, dry, and windy conditions and fueled by extensive grass growth in 2010, wildfires have burned more than 1.3 million acres in Mexico since the beginning of the year. Wind-driven fires in Alberta, Canada destroyed over a third of the town of Slave Lake while forcing oil companies to shut off thousands of barrels of output, and the month closed with firefighters in England battling the largest fire in the country’s history as the country’s spring tied with 1990 as the driest since 1910. 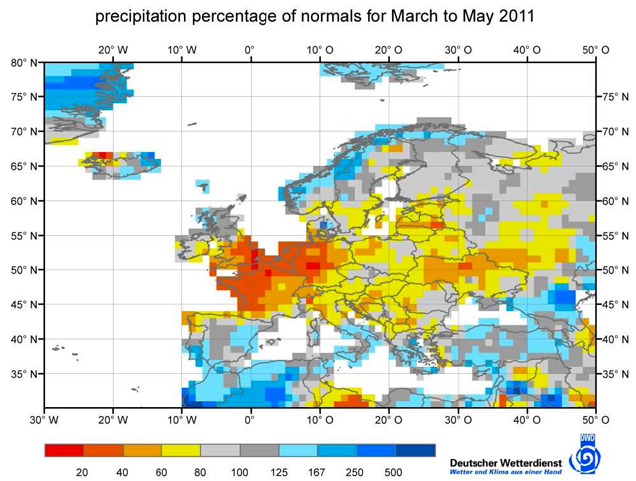 Large areas of Europe continued to face a long-lasting dry period. The UPI reported that local Canadian leaders called the seasonal spring thaw and rain flooding in southern Manitoba the worst in about 300 years. As a result provincial authorities intentionally breached a large dike along the Assiniboine River, intentionally flooding 45,000 acres and 150 homes. Meanwhile, rains and flooding in Columbia this spring have been called the worst in the country’s history impacting nearly 3 million people. And in southern Africa, several hundred thousand residents of Namibia were displaced by flooding as the arid region received more rain in a single day (May 5) than it typically receives in a year. Despite the economic downturn of the past few years the IEA reported that global CO2 emissions in 2010 reached a record level climbing 5.9 percent to 30.6 billion tonnes for the year. However efforts to curb emissions continue to encounter formidable political opposition. Citing inefficiencies in the program, New Jersey Governor Chris Christie announced that, while he acknowledged ongoing climate change and the human role in it, his state would be pulling out of the ten-state Regional Greenhouse Gas Initiative (RGGI) aimed at reducing greenhouse gas emissions in the U.S. Northeast and Mid-Atlantic. While retaining the state’s membership in the RGGI, the New Hampshire state Senate voted to change the nature of its participation, limiting money spent to well-established energy efficiency programs run by the utility companies. Conservative political opposition has increasingly made the subject of climate change an anathema within the U.S. Republican Party. This was evidenced as several 2012 presidential candidates distanced themselves from previous statements and now question the associated science while rejecting potential governmental programs to address it. Meanwhile the Canadian government was forced to admit that it had failed to include increased emissions from oil sands in its official report to the U.N. according to a story from UPI which also noted that tar sands emissions have grown 300% since 1990 and were responsible for 6.5% of Canada’s overall emissions in 2009. The Montreal Gazette reported that the Canadian government has explored hiring a professional public relations firm to promote its tar sands industry. Across the Atlantic, as reported by TIME magazine, the UK became the first country in the world to declare a legally binding target for greenhouse gas emissions beyond 2020, putting the country on a course to cut carbon emissions by at least 80% by 2050, though the program is not without its caveats. At the same time Bloomberg reported that the UK dropped its CO2 offset quality program due to poor participation. The program sought to ensure that offsets bought voluntarily were canceled or retired to prevent them from being sold again. In the wake of the disaster at Japan’s Fukushima nuclear plant, Germany announced it would shut down all 17 of its nuclear power plants by 2022. According to analysts in a Reuters report, the move is expected to add up to 40 million tonnes of carbon emissions a year as the country switches to fossil fuels to bridge the gap to potential renewable sources. The debate over carbon pricing continued in Australia as the federal government announced it would end subsidies for household solar panels a year earlier than promised. Prime Minister Julia Gillard promoted a carbon price as a more efficient means of reducing emissions on a per tonne basis as opposed to separate programs aimed at renewables according to the Sydney Morning Herald. However, based on a poll from Newspoll and The Australian early in the month, public support for a price on carbon stood at only 30% despite 78% of the population believing that climate change is either partly or completely caused by human activity. Within the scientific community, the Arctic Monitoring and Assessment Programme (AMAP) released its latest report on the condition of the Arctic environment. The report, based on contributions from nearly 200 polar researchers, stated that the last six years through 2010 have been the warmest period ever recorded in the Arctic. It projected global sea level rise from 1900 levels of between 0.9 meters (2ft 11in) and 1.6 meters (5ft 3in) by 2100 with melting from Arctic glaciers, ice caps and the Greenland ice sheet making significant contributions. A lower but still considerable sea level rise of between 0.5 meters (1ft 8in) and 1.0 meter (3ft 4in) by 2100 was predicted by Will Steffen, the lead author of a new report from Australia’s Climate Commission entitled “The Critical Decade”. 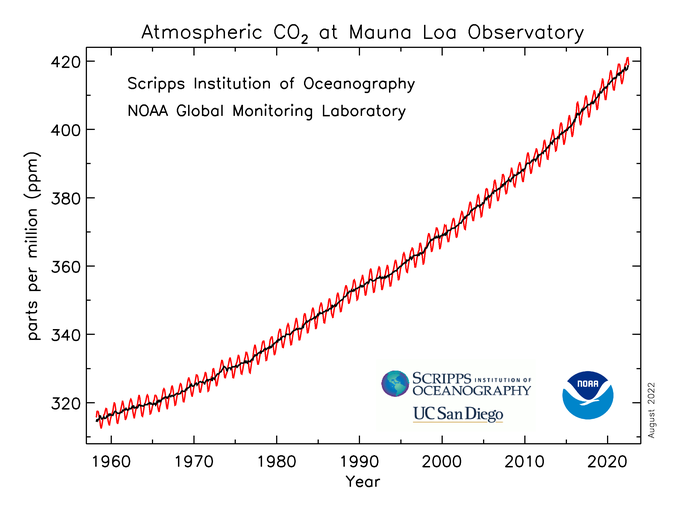 Both sea level estimates are higher than those included in the last report from the Intergovernmental Panel on Climate Change (IPCC) in 2007. The Australian report stated in its key messages that the evidence of a changing climate is “overwhelming and clear”, that the social, economic and environmental impacts are already visible, and that human activities are triggering these climatic changes “beyond reasonable doubt”. 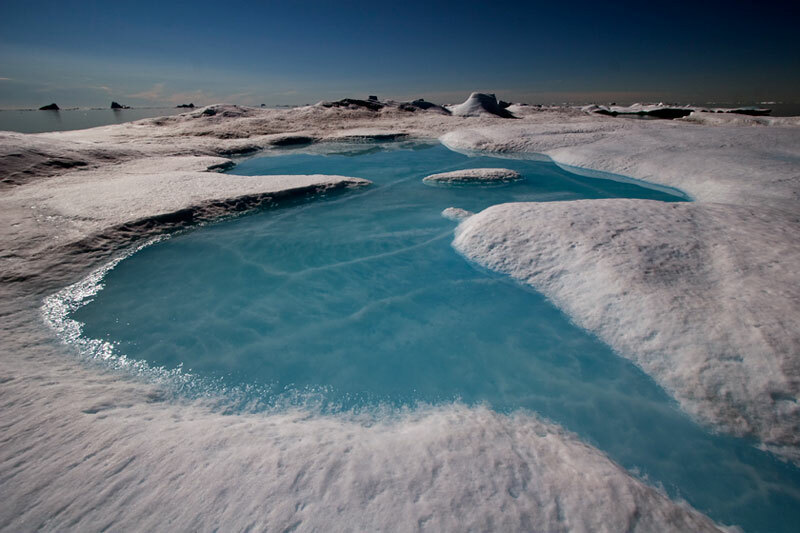 Based on satellite measurements that concur with regional climate models, surface melting on Greenland is unprecedented in the last 50 years and has increased significantly since 1979. 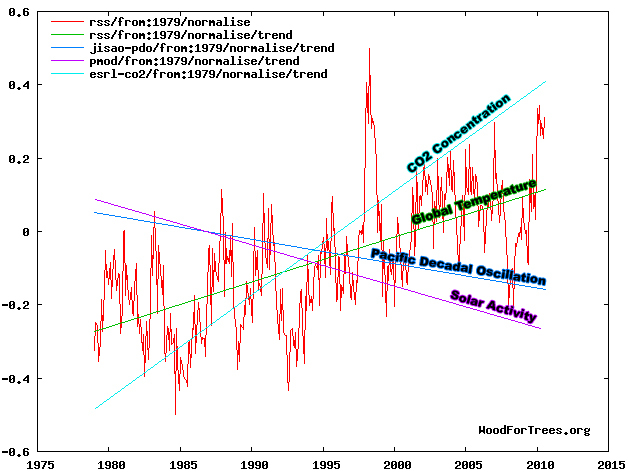 The total melt area of the 2000’s is, on average, twice that of the 1980’s. The fastest moving glaciers in both Greenland and Antarctica have increased the speed of their ice loss and are expected to accelerate even further in the decades ahead. The Antarctic Peninsula, which is warming largely due to human factors, has seen significant changes and ice loss from the Larsen C ice shelf due to thinning and fracturing, though collapse of the shelf is not considered imminent. To the north, as ice continues to be lost in the Arctic, trade sea routes will open further but at the expense of losing land access to much of the region’s interior. As the water from lost ice is added to the oceans, the determination of past sea levels has been complicated by the rebound of land masses since the last interglacial period while changing wind and ocean patterns in the Pacific Ocean may accelerate sea level rise along the west coast of the United States. As rising sea levels threaten coastal ecosystems, new, and perhaps controversial, approaches to conservation of threatened species will need to be discussed according to an analysis that considers changes already underway in the Florida Keys. Also threatened will be global seaports, most of which are woefully unprepared. Rising sea levels along with other climatic changes were examined for their impact on current and predicted global crop production. From 1980 to 2008, while impacts on global rice and soybean crops evened out, rising temperatures reduced global production of corn and wheat by 3.8% and 5.5% respectively against estimates without such climate variability despite technological gains and increased fertilization from higher atmospheric CO2. However, with rising sea levels impacting low-lying regions in Bangladesh, Japan, Taiwan, Egypt, Myanmar, and Vietnam, rice production could be reduced by 1.60% to 2.73% in the future driving price increases of 7.14% to 12.77%. Meanwhile, the international aid agency Oxfam sees the price of some staples such as corn doubling amid a permanent crisis caused by rising demand, flat crop yields and climate change as demand for food grows by 70% to 90% over the next 20 years. Growers of fruit and nut trees in temperate zones will likely also face future troubles in the absence of adequate winter chill to produce economically viable yields. Beyond the food supply, human health is at risk. As rising temperatures are expected to increase the frequency of heat waves, cities can expect more heat-related deaths with a city like Chicago experiencing between 166 and 2,217 excess deaths per year in the closing decades of this century. And, while not the only factor, climate change is seen as a possible contributor to allergy increases in the United States. 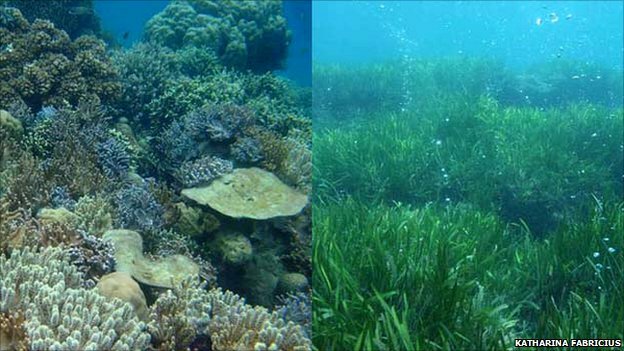 Rising temperatures are also expected to bring a range of impacts to global ecosystems. Warmer and wetter arctic winters could result in ice-locked pastures restricting access to winter food supplies for herbivores such as reindeer, potentially reducing their population growth. Meanwhile, the warmer and drier conditions associated with drought can either improve growth or increase stress on plant ecosystems depending on their access to water reserves. And, while warmer temperatures are expected to accelerate carbon release from decomposition within forest soils, this is expected to be partially offset as trees absorb more carbon thanks to higher nitrogen levels in those soils. In the world’s oceans, changing future conditions in the North Pacific and Northwest Atlantic may impact loggerhead turtle populations with significant reductions in the former region and substantial increases in the latter. Impacts from fishing are also likely to increase the sensitivity of fish populations to a changing climate. As older and larger members are removed, populations become more reliant on younger members that are most susceptible to changing environmental conditions. Fish are also less likely to find refuge as acidifying oceans are expected to severely impact coral reefs by the end of the century based on observations of highly acidified present-day seas near volcanic vents. Why does the Antarctic Peninsula Warm in climate simulations? Relative sea-level fall since the last interglacial stage: Are coasts uplifting worldwide?